Prior to the institution of the Federal Reserve, the US financial system was based on interactions between commercial banks (national banks), non-bank intermediaries (trust companies and, to some extent, unregulated state banks), financial markets, and the Treasury, which indirectly embodied tax and monetary policy. The stability of the system depended on the relationship between the money market and the financial market via non-bank brokerage. The structure of the system provided that bank reserves, whether or not they were subject to the National Banking Act, would be deposited in national banks in a pyramid structure providing greater levels of reserves going up the pyramid from the peripheral banks to the large reserve banks in big cities. These reserves were invested in the call loan market to fund the acquisition of stocks and bonds, thus connecting the money market and the capital market. This choice was partly justified by the fact that long-term financial assets were composed of easily liquidable secondary reserves added to primary reserves. The Panic of 1907 developed following a failed short squeeze that led to the bankruptcy of a major trust company. The trust companies had an asset structure with relatively low liquidity and a high level of leverage. 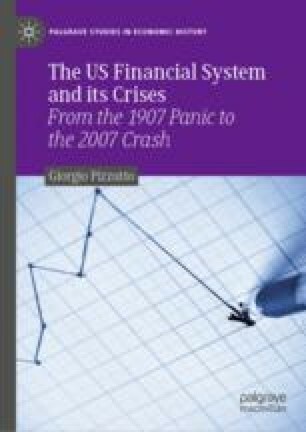 The Panic involved financial intermediaries other than commercial banks, i.e., the trust companies, which then suffered a bank run. The national banks realized that they might be indirectly involved in the crisis because of the prevailing trend toward sales of financial assets, and so J.P. Morgan quickly rallied a number of bank presidents and organized a collective rescue operation that succeeded in stabilizing the market. But the awareness of the instability of the financial system strengthened the conviction that there was a need for a lender of last resort.